I'm so fickle. When snowdrops and daffodils burst into life, I declare that I love springtime. But I like to move with the times so, as the weather gets warmer and flowers and veg grow strongly, summer is my new favourite. 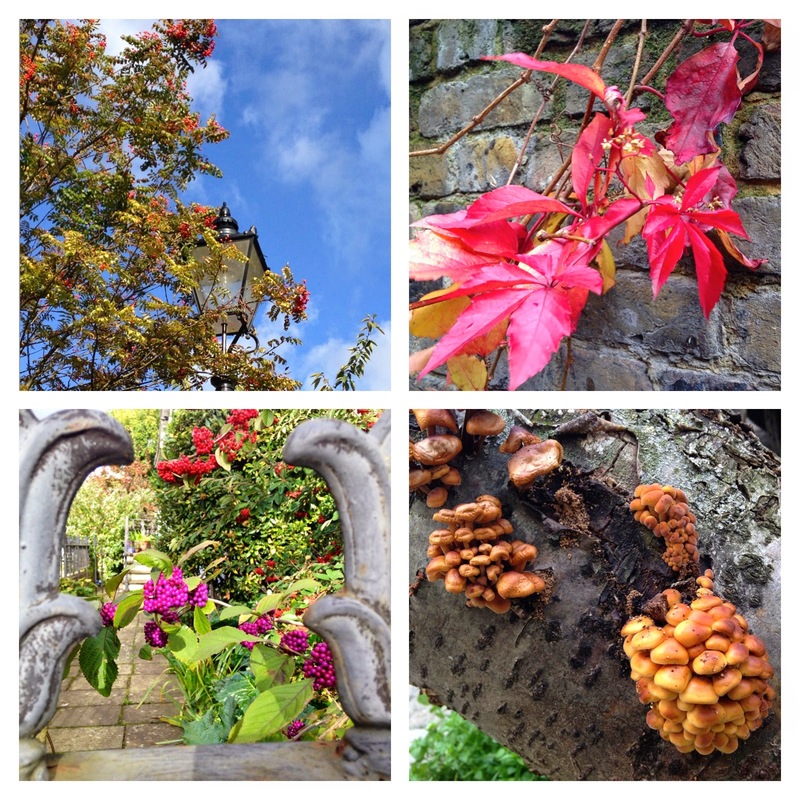 Autumn will always win my heart over with vibrant displays of colour. Truth is, I just love everything about being outdoors in nature and its moments of beauty. 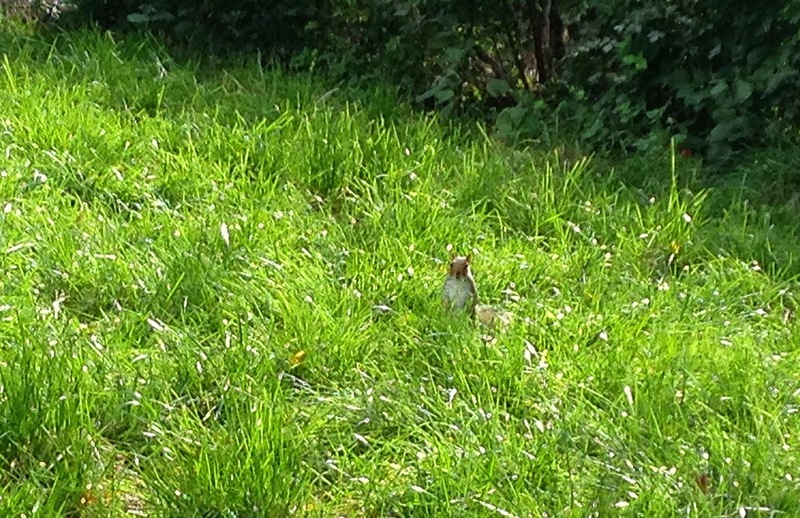 I only saw the squirrel in the long grass when his bushy tail appeared as he moved. He was oblivious to people passing by as he rummaged around almost undetected but popped up to face me when he heard the camera on my phone. It was one of those moments. 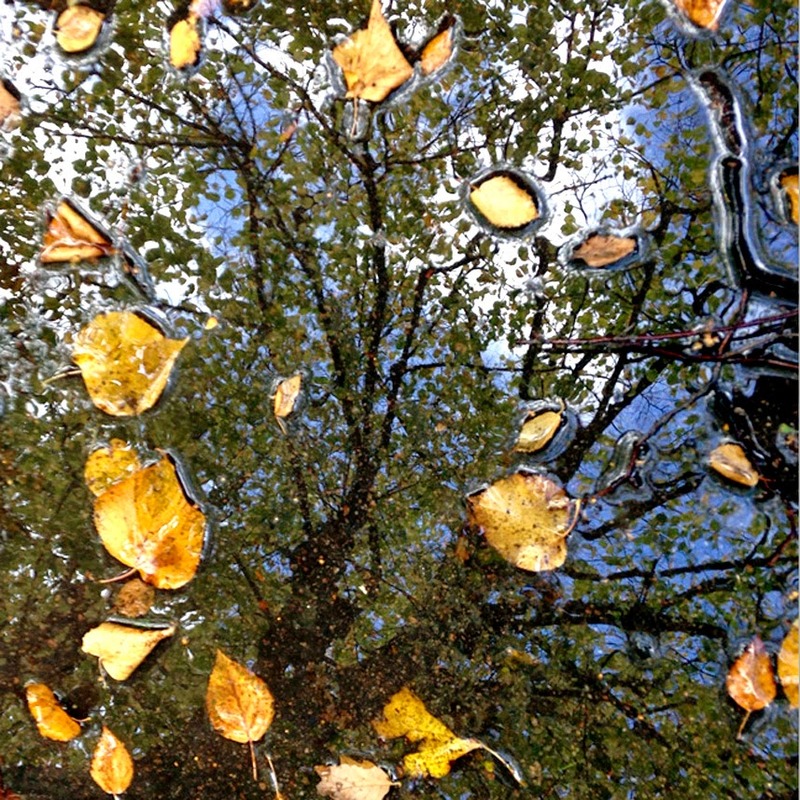 Still looking down, I saw autumn in puddles … which made me think of the beauty of fallen leaves. 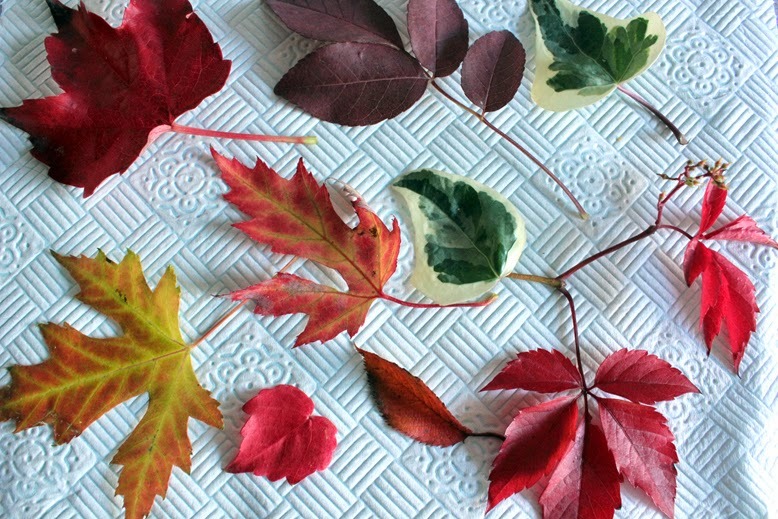 Every autumn I'm completely obsessed with colours and patterns as leaves turn from green through all the yellows to red. 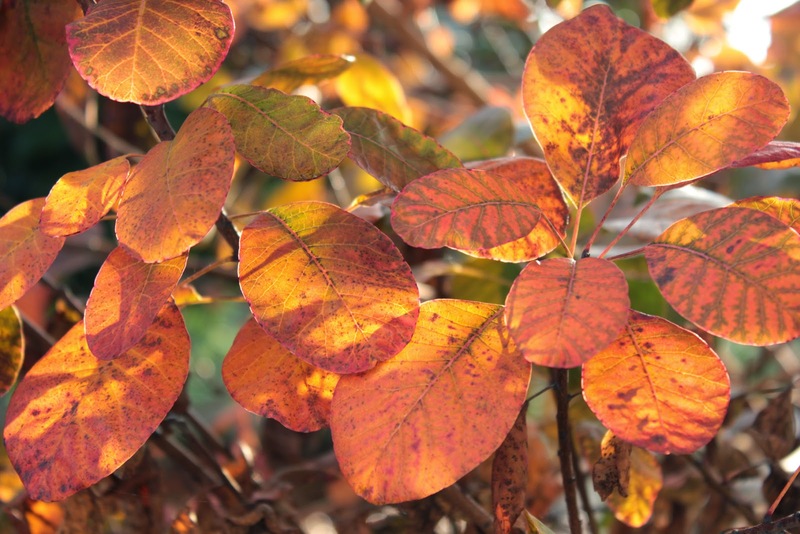 There are some great leaf shapes falling and now is a good time to go leaf collecting with children - either for making leaf mould in sacks for the garden or to collect colours and shapes for creative work. I'm totally energised by blustery and bright weather and just have to be walking outdoors - and that's when colours really start popping out at me. Even after years of knowing about the beauty berry plant (Callicarpa bodinieri), I'm still awestruck by the vivid purple of its autumn berries (bottom left). 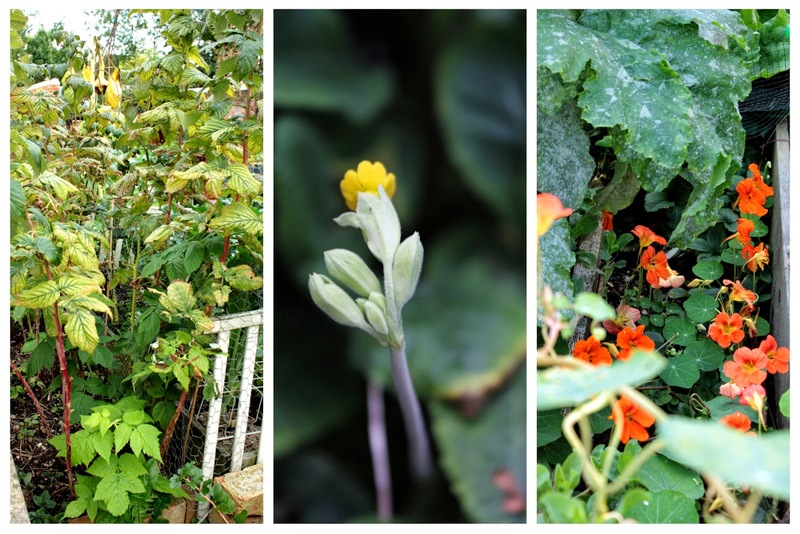 These photos were taken over several days out but even after all this awesome loveliness, it was still thrilling to see the mind-blowing colours of the nasturtiums in the garden and one of the poppies is about to flower for the third time this year! I have some time off work next week so I'm hoping to get to RHS Wisley. 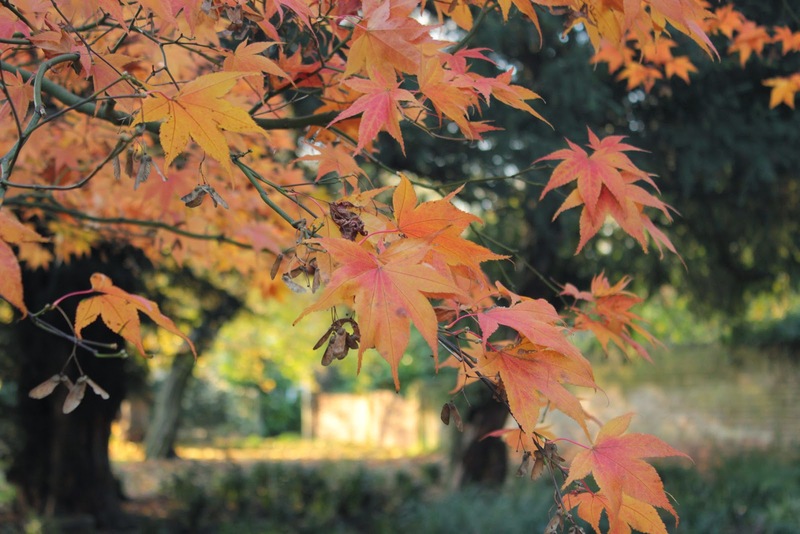 The autumn colour there should be amazing - I'm looking forward to seeing the spindle (Euonymous europaeus) and liquidambar trees. I'd better take a bag for collecting some fallen leaves, I've a feeling there will be more days like these. That's it then. 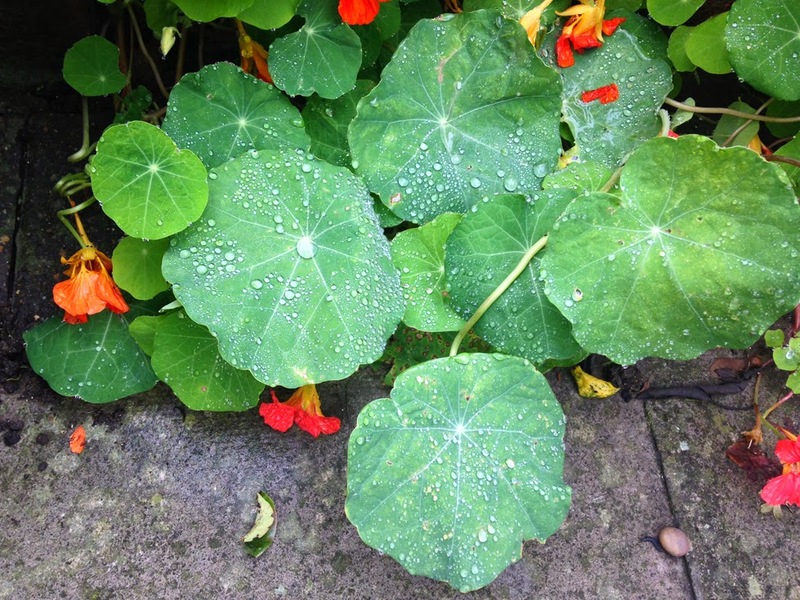 The garden and I have been firmly tipped into autumn this past week. Ten days ago, I enjoyed a lovely warm sunny afternoon and then, the very next day, got soaked tying up some garden waste bags. The sky went from drizzle to deluge in minutes and, despite a showerproof coat, I was literally soaked to the skin (and feet) in minutes. Hence the filthy cold that has dogged me for the past few days. Cough, sniffle, sneeze - evenings spent heading off early to a cozy bed with a stack of books and a hot drink. 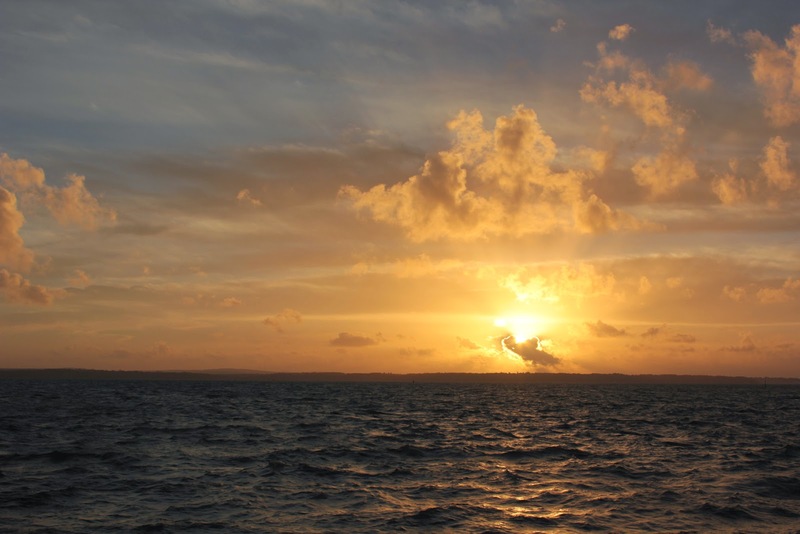 I love those clouds with silver linings. Ferocious wind and rain last weekend flattened so many plants in the garden. 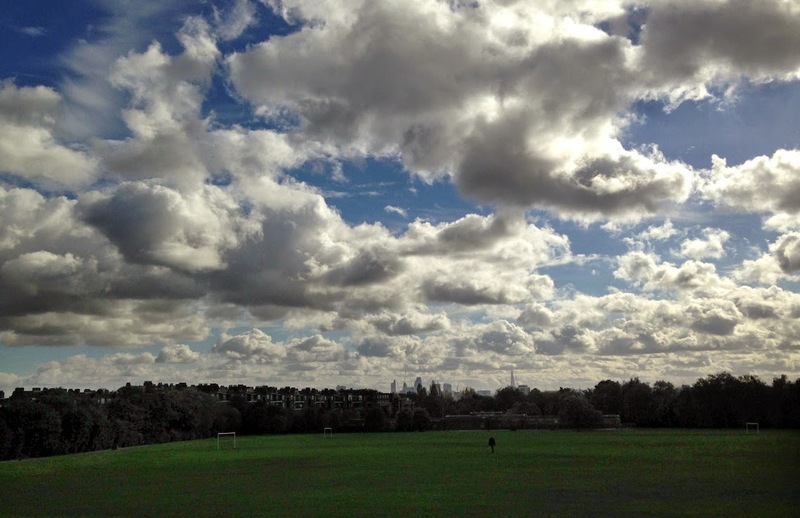 There was more torrential rain on Monday morning but I took advantage of a break in the clouds to get outdoors. 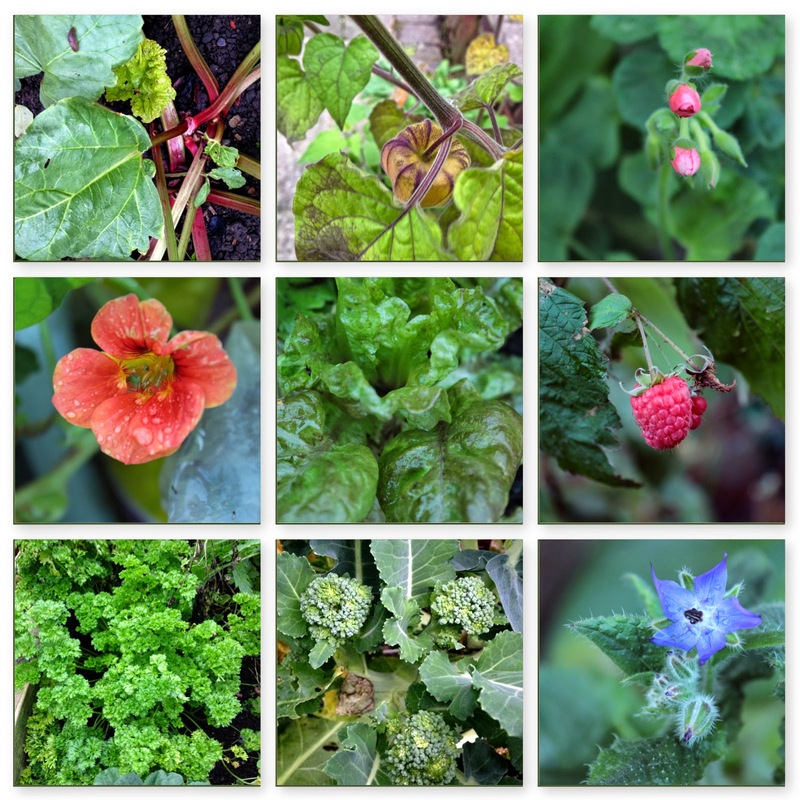 The air in the garden smelled of crushed lovage (a bit like spicy celery and a lovely herb to add to soups and stocks) and several of the brassicas will need staking up but, on the plus side, everything sparkled with a dusting of raindrops. The biggest of my courgette plants has been toppled by the storms. I'd picked the monster courgette/marrow the night before (luckily) with a handful of tomatoes and some spring onions. 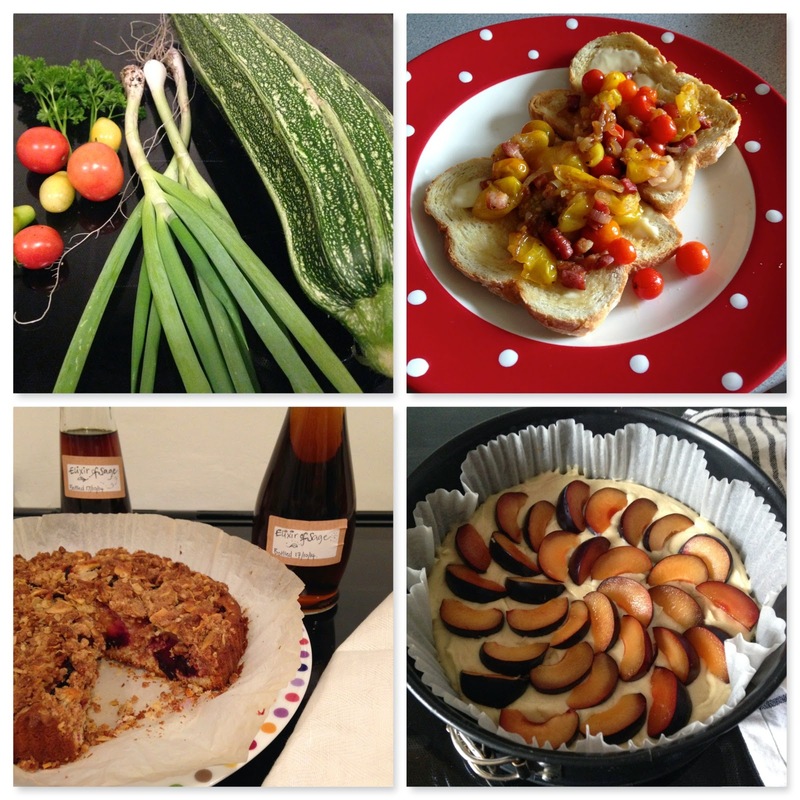 I've been putting together a new Pinterest board of seasonal recipes which I call 'Autumn in the Kitchen' (See? over there on the right!) and rather liked the look of a stuffed courgette creation that I came across. I cooked this last night, sharing half the giant courgette with my gardening neighbour, and tweaked the recipe to use up a few pre-weekend-shopping fridge ends - a bit of chopped red pepper, a few mushrooms, a shallot, the spring onions from the garden, chopped garlic, some bacon, half a small pot of yogurt. The giant courgette was gutted and it's innards chopped and added to the mix which was then piled back into the shell. Popped in the oven for 20 minutes with cheese on top, it was delicious and made more so by the smug feeling of having eaten really healthily. I love adaptable recipes and will make this one again, maybe next time using breadcrumbs or rice in the stuffing. It was a bit dark to take a photo of the finished result - sorry. Trawling through the internet for culinary inspiration using seasonal fruit and veg is a really fun way to anticipate the pleasures of autumn. Once the evenings get darker, I'm happy to be found in the kitchen cooking up sturdier, warming food - stews, casseroles, pies and cakes. 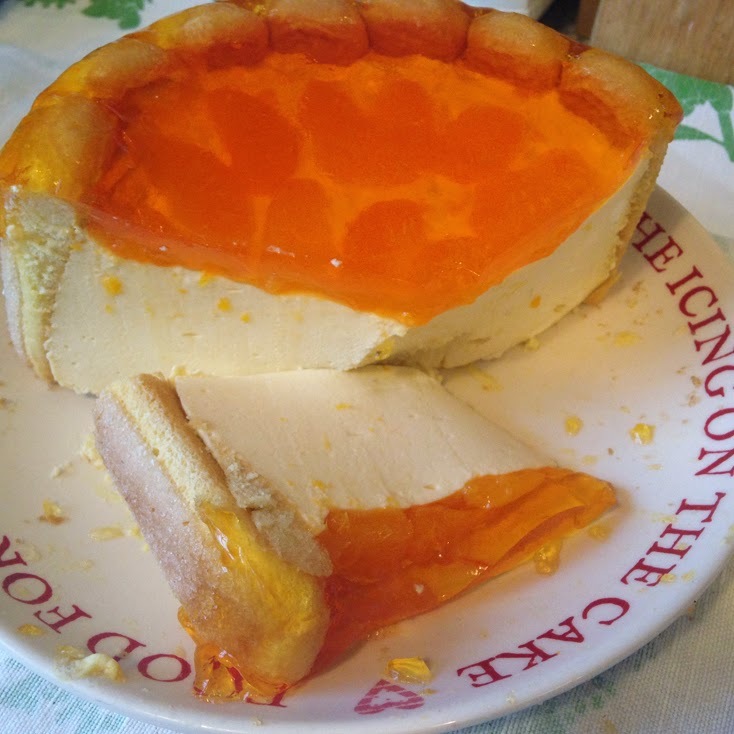 I've found some tempting recipes (butternut squash pancakes with sage butter, pear and damson breakfast muffins, plum pudding cake), mm-mmm, sounds good! For now I'm still eating at least one salad each day with homemade coleslaw, (love that crunch!) but am adding bookmarks to two wonderful books that I've borrowed from my local library. Serious slimmers should avert their eyes now. Excitingly (for me), I have "first fingers" (as my son would say) on these books; childishly, it gives me huge pleasure to be the very first person to open the pages of a new addition to the library and these two are a couple of corkers for the autumn recipe hunter. 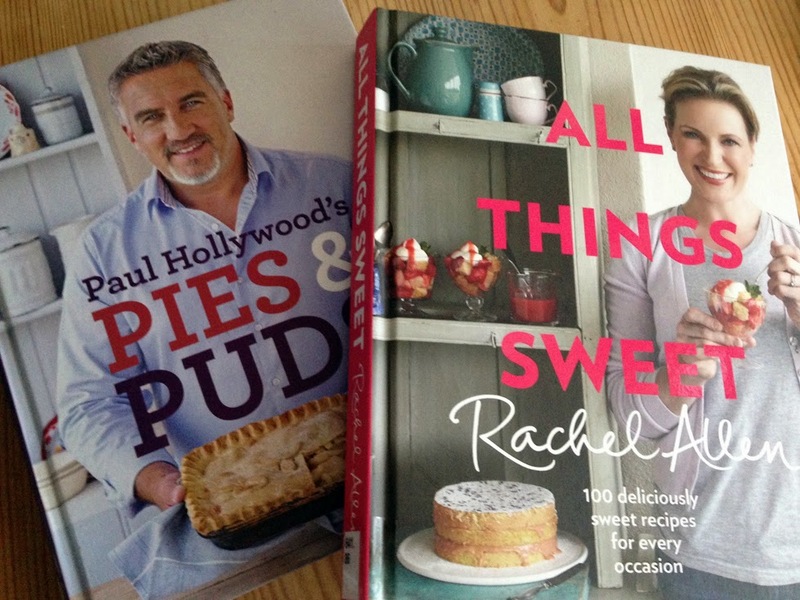 I've already got my eye on blueberry bread and butter pudding from Rachel Allen and will definitely be making sweet beetroot pie (in the tradition of an American pumpkin pie) from Paul "Great British Bake-Off" Hollywood. And there was me thinking that, with my son at uni, now would be a good time to try and lose a few pounds. I've spent a lot of catching up time in the kitchen this past week, bottling tomatoes and making plum jam and fruit roll-ups (recipes will be forthcoming) but there is a tiny glimpse of blue between grey clouds today so I think a bit more garden tidying is in order … especially as for tea I have a Plum and Cinnamon crumble cake whose recipe I've rediscovered having used it to bookmark a recipe for a spicy carrot and tomato relish. I definitely need to get out more, if only for the sake of my waistline! Plum and Cinnamon Crumble cake with Elixir of Sage, recently bottled; Plum cake being assembled. 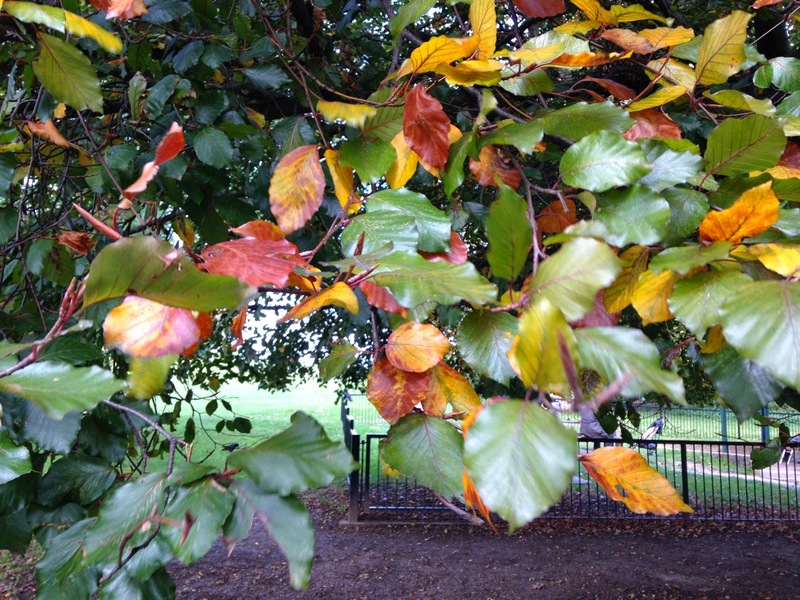 It's Autumn, but not as we know it. The late Christopher Lloyd, renowned for his fabulous borders at Great Dixter, adopted a practise of taking a morning stroll around the gardens each day with his head gardener to discuss the plan of action for the day. 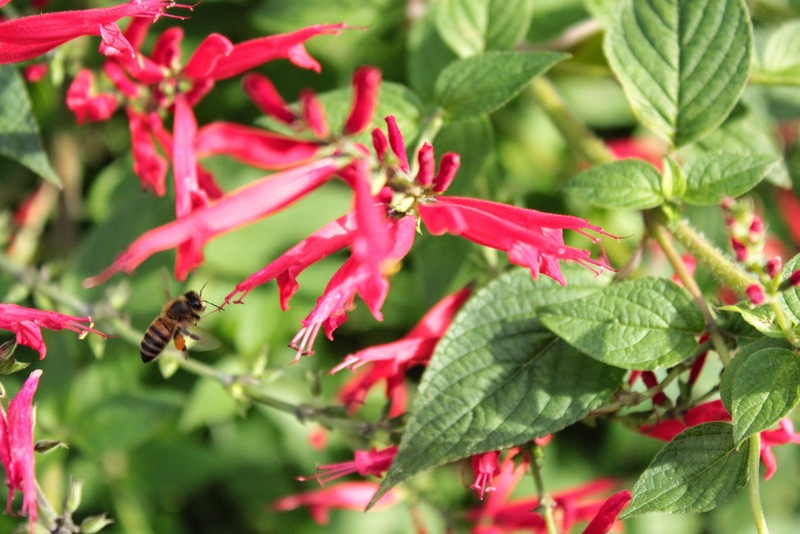 It's a great habit to get into as often the garden itself will suggest what needs to be prioritised. A few days ago, I went to the garden here intending to take photos for the blog. Three happy hours later I'd got photos, staked up some flopping raspberry canes, lifted (chucked) piles of overgrown nasturtiums that were shading herbs, pruned some lavender that was becoming a tripping hazard on the path, dug out some horseradish, weeded around the broccoli and cut off some old courgette leaves to make the space more manageable. I also cut back leaves to allow the tomatoes to put energy into ripening the remaining trusses and found that one of the Sungold plants had gone rotten half way up the stem so I was able to cut the plant down and save those tomatoes to make a green tomato chutney. 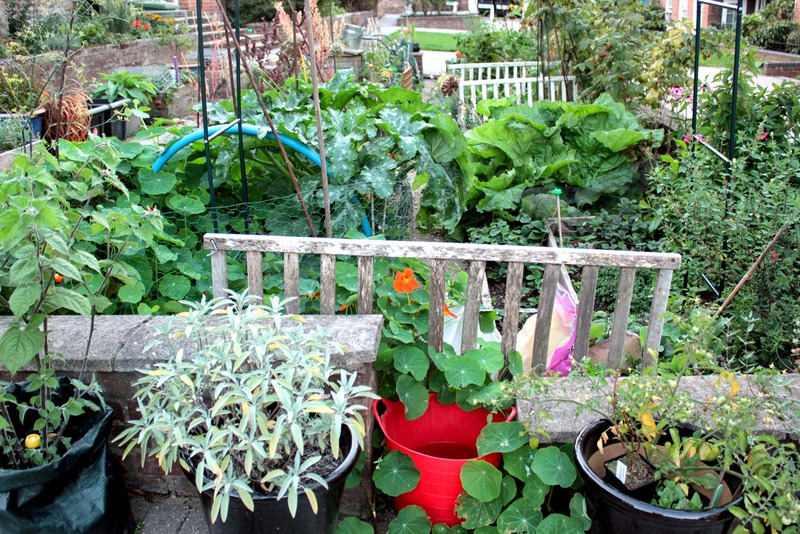 I'm wondering what possessed me to put rhubarb, courgettes, globe artichoke and nasturtiums in this tiny space! Lush, though, isn't it? That still left me with a bit of a jungle down one end of the veg patch - and the realisation that with Linaria (the plant edging the path, above) you most definitely can have too much of a good thing. 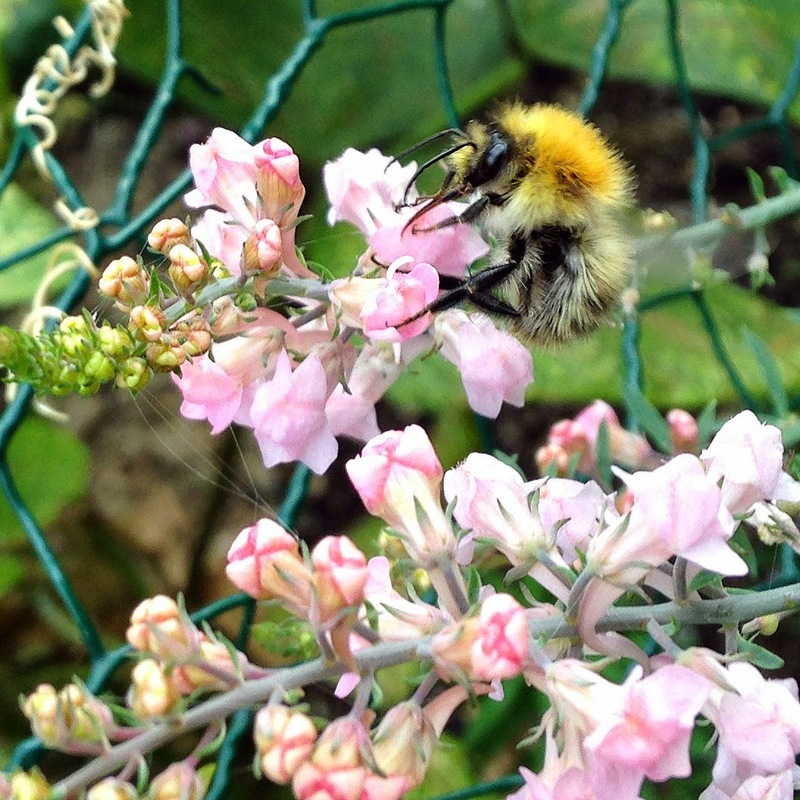 (It's self seeded into every crack and corner in the veg patch but the bees love it.) I was also then able to look at the garden with a fresh eye this morning when I took another walk round with my neighbour Karen who helps out and also gardens the border under her window. Friday is our community gardening day, when time permits. What we saw was new spring growth all around: new raspberry canes, poppies flowering having completely regenerated in the past month, same with the globe artichoke, the rhubarb leaves are now as big as a gunnera with no sign of dying off, the nasturtiums have formed a river of flowers down the path and even the cowslip is in flower (usually not seen until March). Karen reports that her daffodil bulbs are starting to sprout. While this is all utterly delightful, it shows that we can't rely on the plants knowing which season they're in; it would seem their seasonal clocks have been thrown off the beat by the chillier weather of a few weeks back, now replaced by warm t-shirt weather in early October. 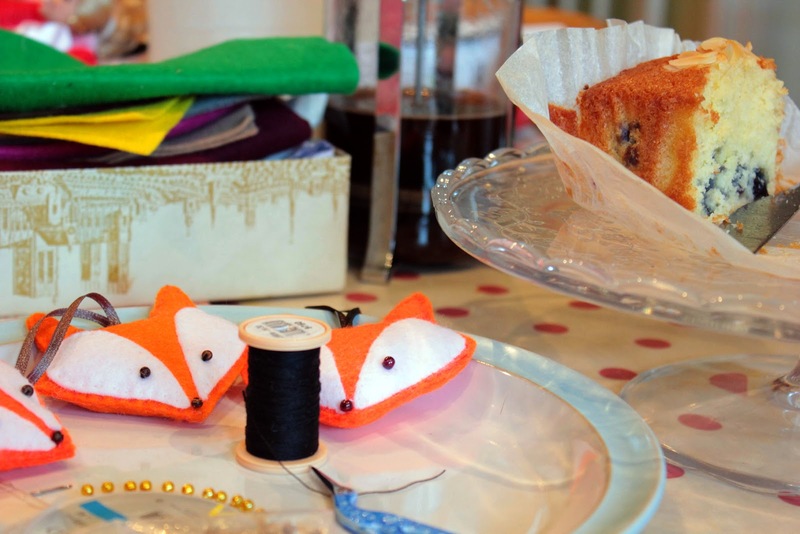 Better make sure to have some horticultural fleece ready when the frosts do come! In other news, I'm still harvesting a few raspberries, courgettes, tomatoes, radishes, salad onions, salad leaves, spinach and a few beans. The bean leaves are looking very tired so some of the beans have been cut down (roots left in the soil so the nitrogen fixing nodules can return nutrients to the soil) and any remaining pods on the others will be allowed to grow into seed beans for next year. These are the Canadian Wonder beans that I really didn't think would amount to much this year but have done wonderfully well once protected with anti-slug wool pellets. Sugar snap peas sown at the end of summer are now flowering so pods won't be far behind. The yellow sunflowers are finished and I'll harvest some of the seeds to shell and add to salads. The others will be left for the birds. 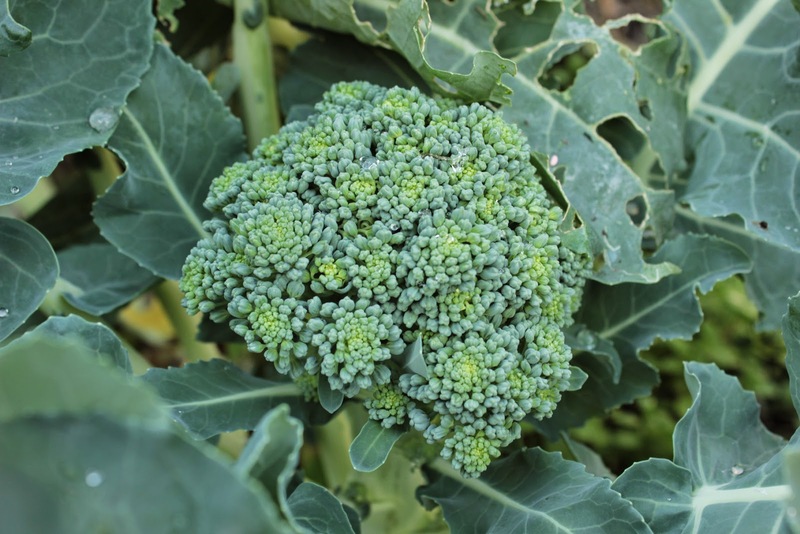 The brassicas (broccoli, kale, romanesco cauliflowers) are growing really well, as are the chard and beetroot. 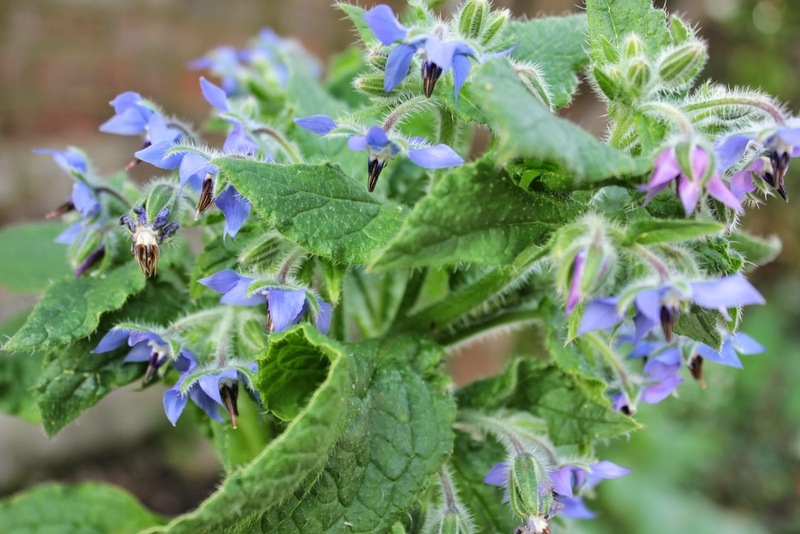 I wonder if this is due to the wool pellets around them - they help keep the slugs at bay but also leech nutrients into the soil when it rains and as they decompose. Hopefully this bodes well for early and late winter veg. 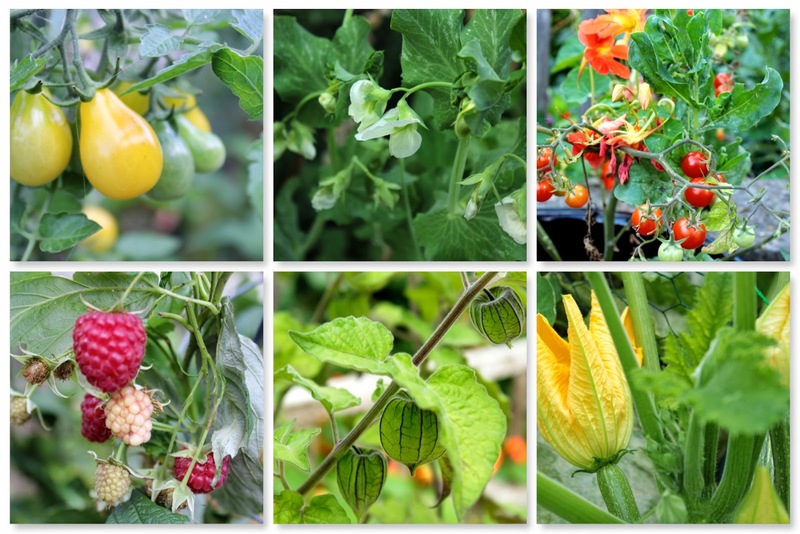 The photo above reminds me that this lovely extended summer encouraged the physalis to reflower in early September; providing the pods ripen, I can greedily anticipate another two dozen Cape Gooseberries before the year ends! Oh, okay, I'll share. 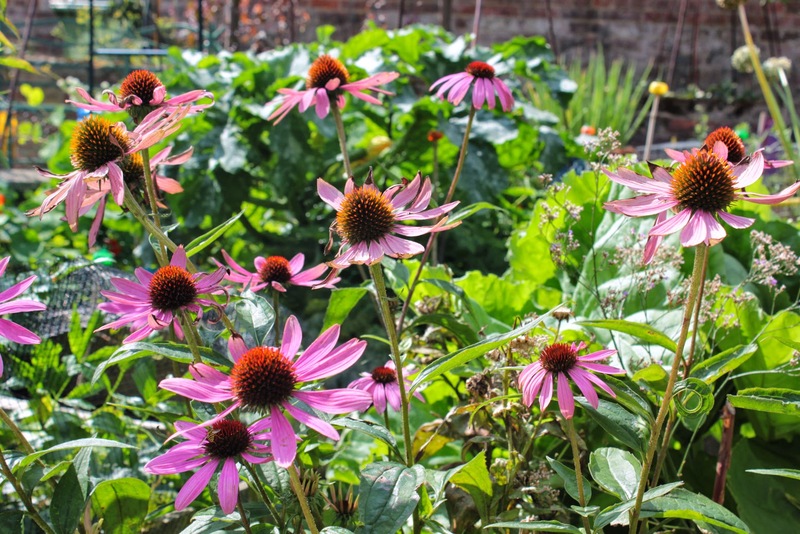 Thanks to the warm, and sometimes wet, weather, there's still a rainbow of colour throughout the York Rise gardens. I particularly love the chinese plumbago (Ceratostigma willmottianum) - I'm drawn to its startling blue flowers every time I pass, especially as it sits next to the salmon coloured pelargonium 'Pink Needles', an amazing colour contrast. I honestly didn't think I'd have anything to write about this month but, actually, it's all come right and been rather special. Heavy rain is forecast for the next few days but, for now, me and my garden are in a good, good place. Get ready to fleece on cold nights! 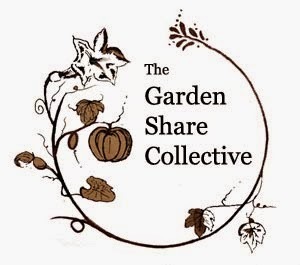 Linking up with the Garden Share Collective over in Australia. 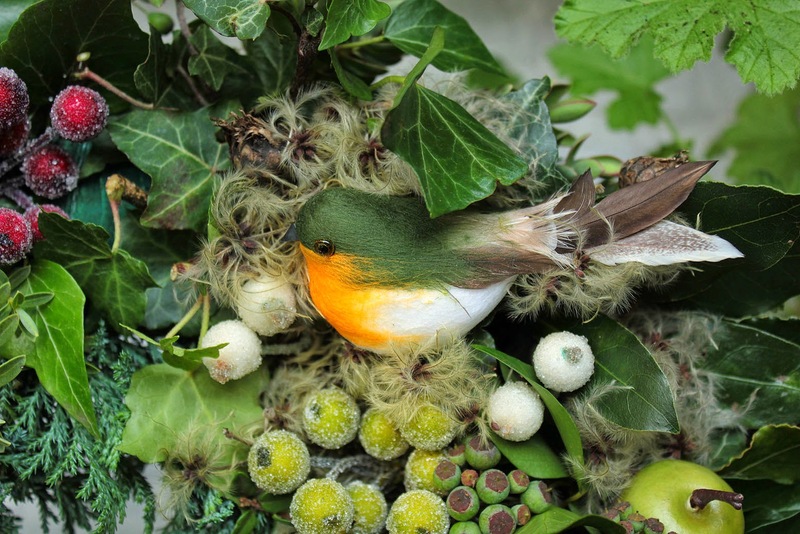 If you want to see what's growing on in other parts of the world, pop over to Lizzie's blog for all the links. Autumn is the new summer, to borrow and misquote a piece of fashion nonsense. Days like today and yesterday are my kind of weather: the sun is shining but it's warm, not hot, I've got washing drying in a warm breeze outside and there's a gentle buzzing of bees in the shrubbery and gardens. It's left me hopeful for an extension to summer, a boon after the chilly and wet end to August. Having recently said that the veg patch was all leaf but little produce, I may have to eat my words - as well as lots of fresh garden veg. It seems that the watering issue was at fault. A few days of torrential rain, some cooler weather and suddenly we have the right conditions for growing happy veg. I brought home an armful of beans, courgettes, tomatoes and raspberries last night (just before it got dark at 7.30, a sure sign of the changing seasons). A stroll round the garden at lunchtime today showed what I missed. 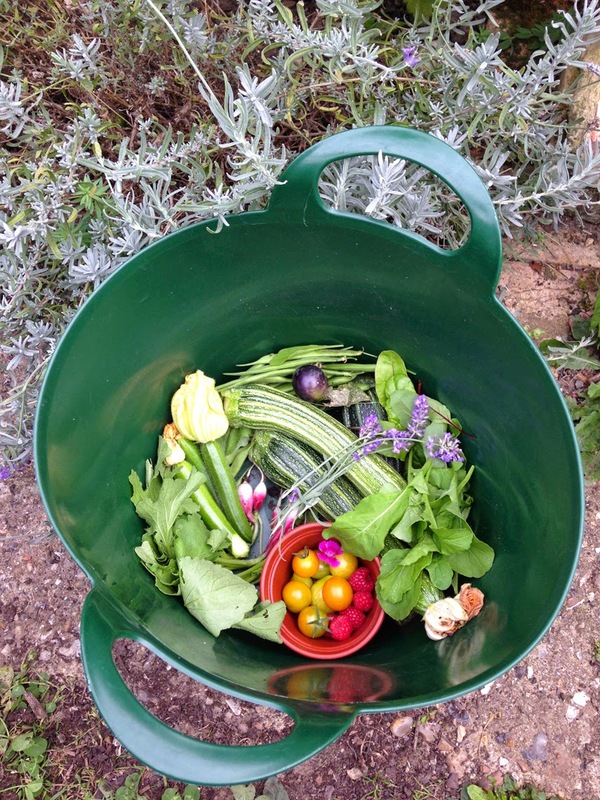 3 huge courgettes, 3 small finger courgettes, more beans, sungold and yellow pear tomatoes, a few more raspberries and lovely fresh leaves (spinach, rocket, chard and beetroot) and radishes for salad. Which reminds me, I'd better sow some more lettuce as only two of the Marvel of 4 Seasons has grown. I'm leaving those two to get a bit bigger before I start picking. 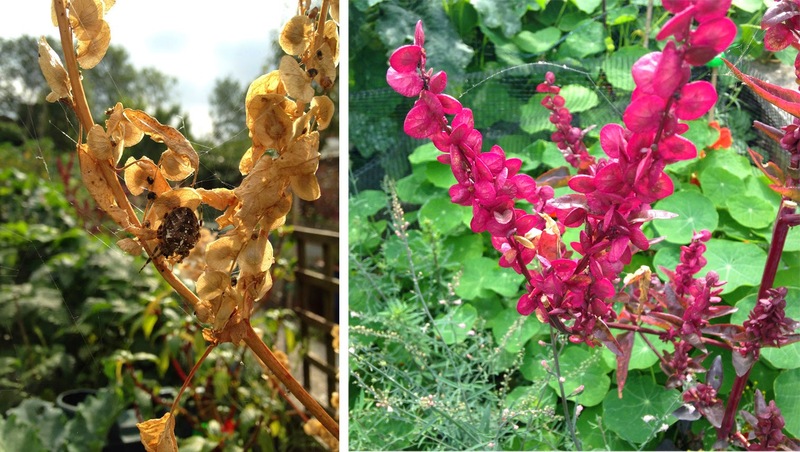 The seedpods of orach aka mountain spinach (Atriplex rubra) have turned golden with only one plant left with the lovely bright pink discs lighting up the veg patch. 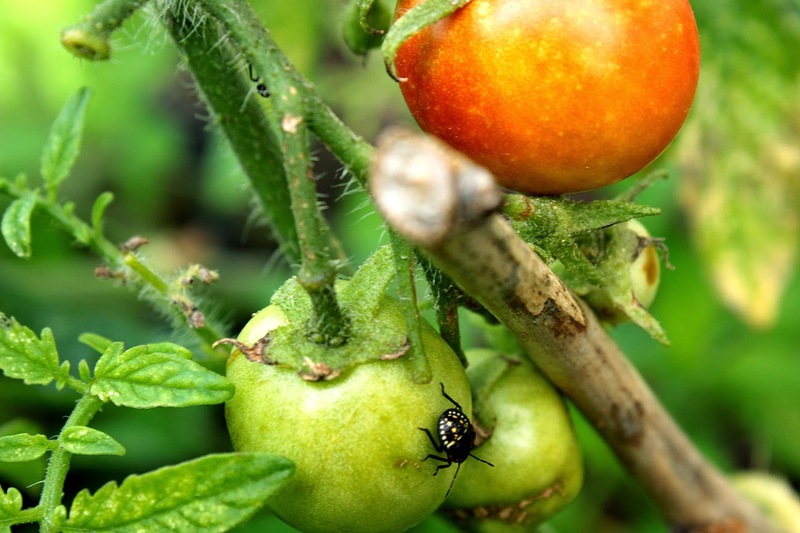 Spiders and their webs are everywhere, caution is needed when picking salad leaves so as not to disturb them. 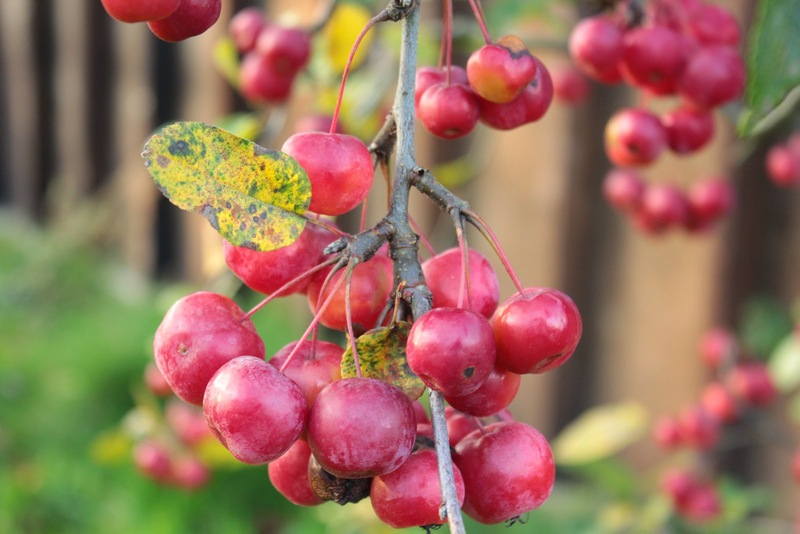 Yesterday was made even better by discovering several crab apples trees. I suspected what they were, took a photo and posted that to Twitter and Instagram asking for help with identification. Jules, the Suburban Veg Gardener (@embergate) confirmed in the affirmative. 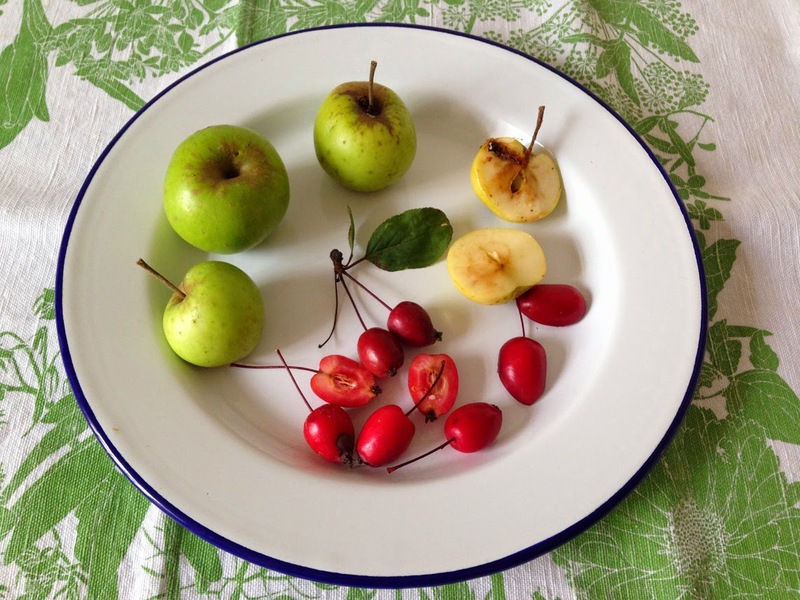 Slicing one of the fruits in half at home sealed the deal - yes, definitely crab apples and definitely going foraging soon for rosehips and crab apples to make jelly and, perhaps, also some rosehip syrup to ward off winter colds. The green apples were growing on the other side of the Heath path and are sweet apples of some sort. There's a bookshelf in the design studios at college where unwanted books can be left for others. It was there I found a small pocket sized paperback of Bob Flowerdew's Planting Companions earlier this year. As I garden organically, I do consider Bob one of my gardening heroes. He advises that tomatoes benefit considerably from being grown with asparagus*. After reading it, I thought I was being so clever when I set six of my tomato plants out into ring culture pots within the asparagus bed. As the bed designated for growing asparagus is just one metre square, the crowns are positioned like the dots on a five-dice. The tomato plant pots formed a circle around the central asparagus plant. As mentioned in my August end of month post, with hindsight, this left them too close together for the fruit to ripen in a timely fashion, until I stripped the lower leaves off. (Although, in a sense, the method does work as I had enormous plants.) By mid-august I noticed that there was a colony of what appeared to be tiny living dots enjoying the warmth at the top of one of the lower trusses. I thought they might be just hatched spiderlings. See the mottling on the top of the tomatoes? I assume that's bug damage. I don't mind spiders and they don't do any harm so I left them alone. As the insects got bigger though I could see that they were, in fact, beetles of some sort. Time to investigate. 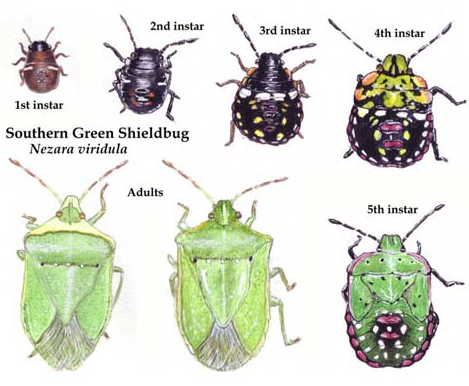 My old friend Google told me that the bugs are Nezara viridula, more commonly known as the Southern Green Shield bug. These differ from the more alliteratively named Palomena prasina, bugs that do little harm to the garden. Nezara viridula have arrived in London in the last decade, believed to have travelled over from Africa via Europe, and can be found on tomatoes, raspberries, beans, mallow (Lavatera), Verbena and Caryopteris. No wonder they're happy in my garden. They also favour allotments; bean growers beware. If handled, however accidentally, they emit a pungent odour. 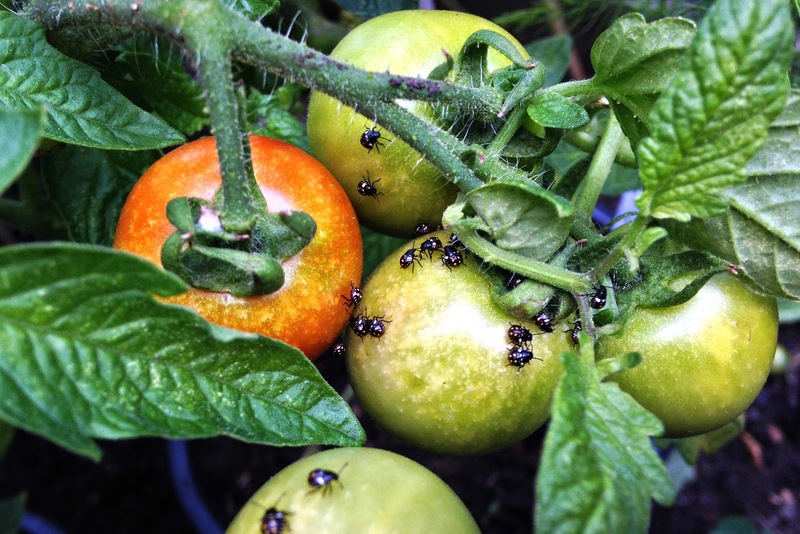 All shield bugs are sap suckers (not as bad as aphids though) but the Southern Shield bug can cause minor damage to beans, tomatoes, etc by causing the fruit to distort. 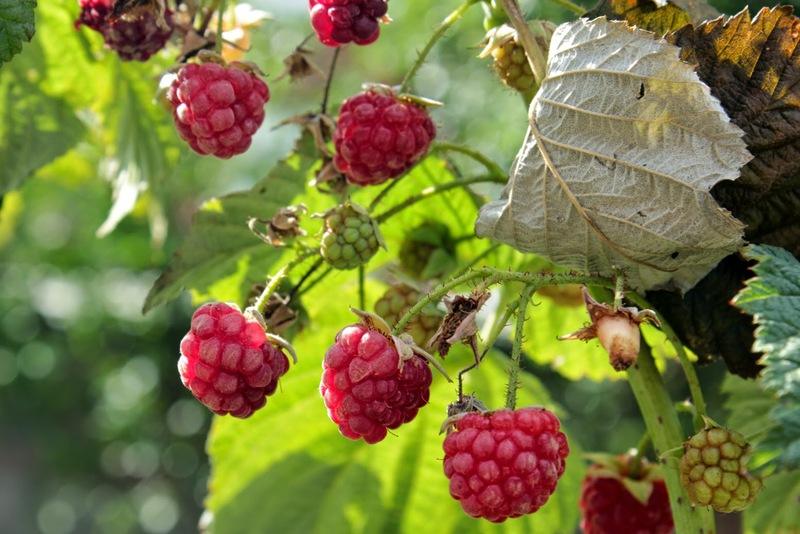 They're not considered a pest by the RHS as they're most numerous at the end of the season when fruiting is coming to an end. So what's to be done? Nothing. (Except (note to future me … ) space your plants out a bit more so that there is more air circulating and less hiding places.) 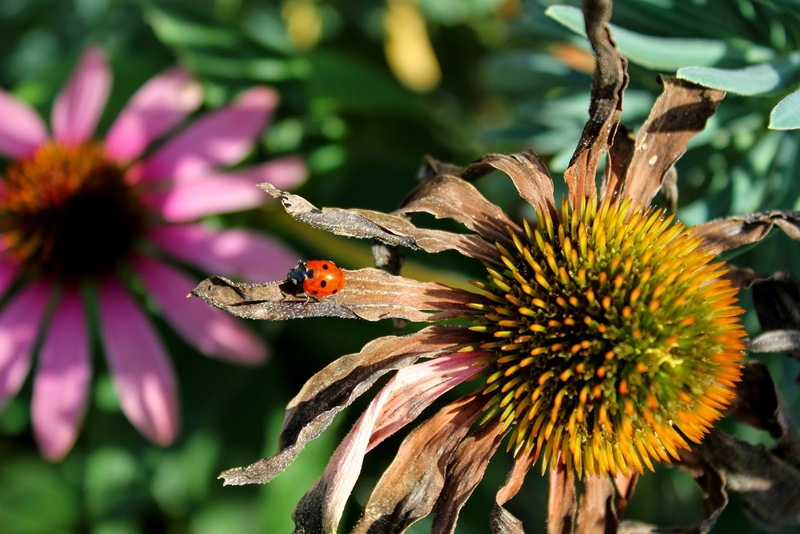 Shield bugs will not do sufficient damage to warrant pest control. 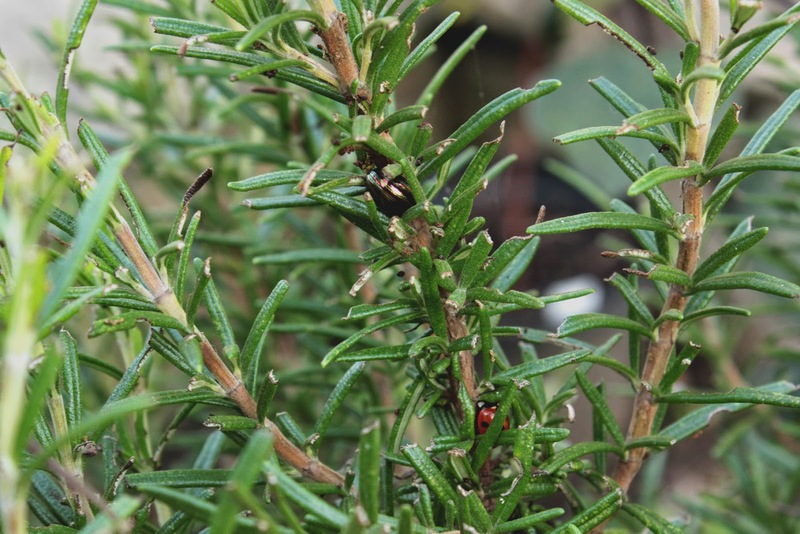 The adults overwinter and lay eggs on the underside of leaves in the spring so if you don't want them on your plants, check and remove. Although that would be a shame as, in my humble opinion, they are all part of the garden's rich tapestry. And rather fascinating to watch. 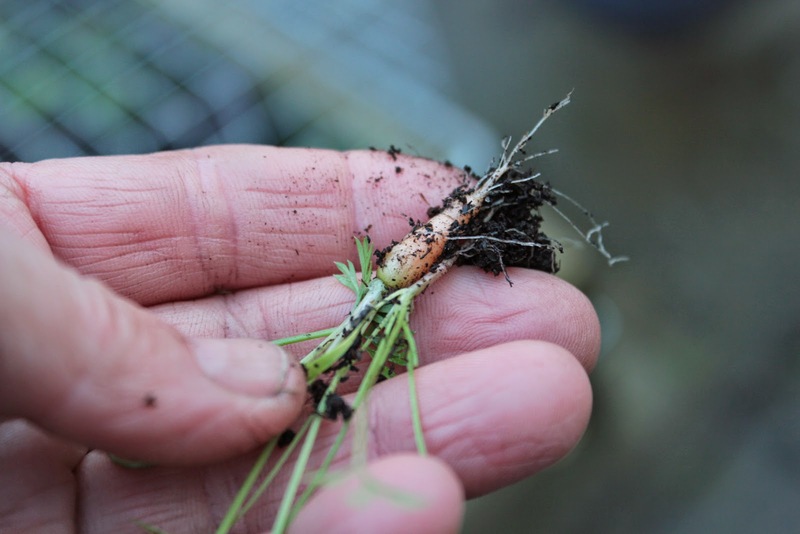 The science bit: Asparagus roots kill trichodorus, a nematode that attacks tomatoes and in return tomato leaf spray will keep asparagus beetle at bay. 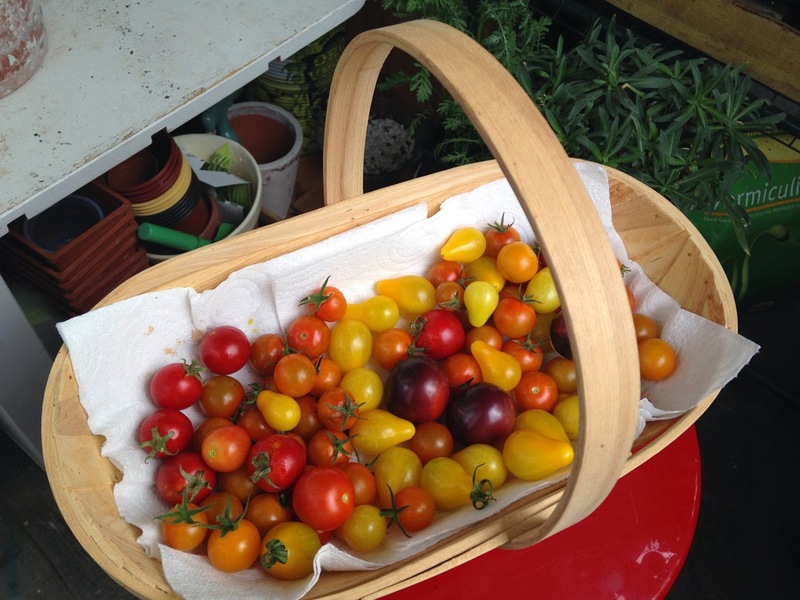 Tomatoes also enjoy the company of parsley, basil and nasturtiums and they may be protective of gooseberries. Certainly my gooseberry bush, growing next door to the tomatoes, appears very healthy. Case closed (for now). I'm pleased August is over; it was too hot and too dry (unbelievably for the UK) and September is always so wonderfully lush - the penultimate hurrah of the season. Without a tap in the veg garden here, the plants have had to struggle without water while we had nearly a month of no rain. My water butts ran dry in the first week; after that, the plants were on their own apart from a few daily cans of water going onto the tomatoes and asparagus beds. A friend on the top floor used to lower a hosepipe connected to the water supply in her flat. Since having new taps, the connector doesn't fit so I've been carrying water from my bathroom, two blocks and four flights of stairs away. Shallow-rooted raspberry canes have really struggled with the lack of water and it shows in their leaves. Even the courgettes stopped fruiting and any courgettes that had formed simply yellowed on the plant. (They have slightly perked up since the rains came. 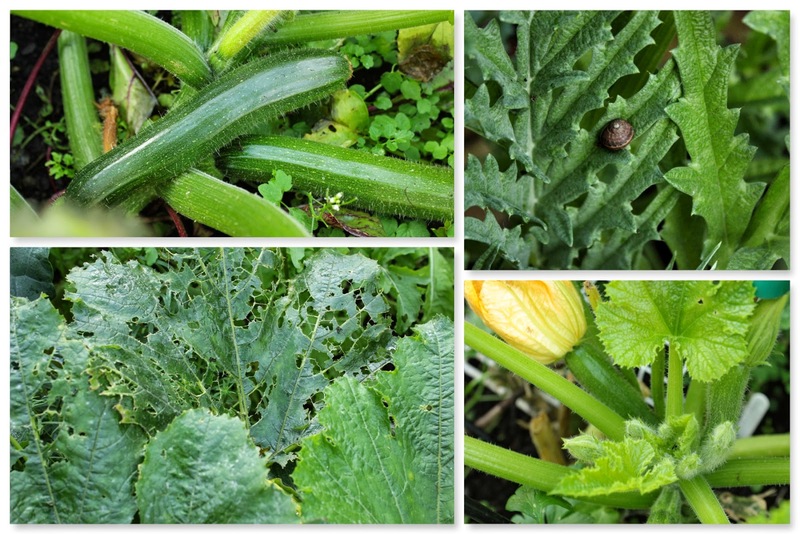 The plants, that is, not the yellowing courgettes.) Not quite the bountiful harvest that I'd hoped for. I am thankful not to have to deal with gluts of beans and courgettes but a few more would have been nice - especially since the courgette chutney I made turned out to be delicious. I've a feeling those jars won't last long enough. Just when I was completely despairing at the lack of water and I'd been out to buy a fourth hosepipe so that I could connect them up to reach the nearest tap (over 200 metres away), the wind picked up, the skies turned grey and it practically didn't stop raining for the last week of the month! Buckets left out to catch any rainfall filled overnight (or within an afternoon's rainfall). I got caught out in a sudden shower a couple of weeks back and even my waterproof was soaked within minutes and my shoes waterlogged as the drains were unable to cope with the downpour causing huge lakes to form on the roads. At least the garden was finally getting watered and seeds sowed between showers popped up within 48 hours! 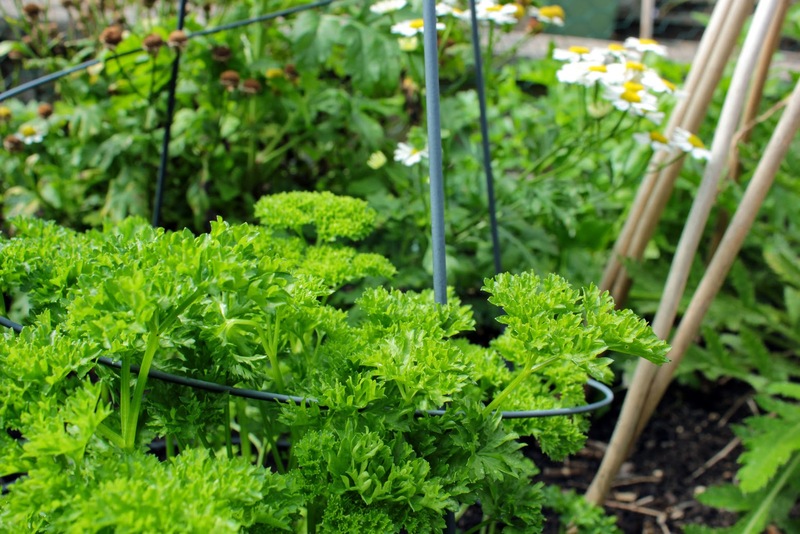 Curly parsley and feverfew in the herb bed. UK weather is notoriously variable but this past month has gone from the sublime to the ridiculous with very little inbetween. 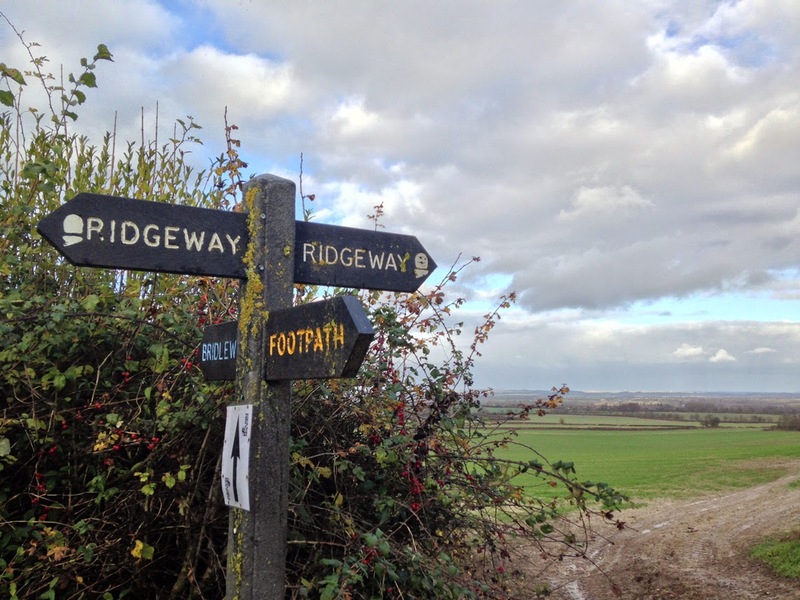 At one point, I set out in sunshine and was being rained on by the time I reached the end of the road; as I turned around for home, hailstones of ice pounded down on me and I returned home as thunder and lightning rumbled across the skies. Just a normal British day? For a while, yes. So how are things in the garden? Truthfully, only rosy-ish. 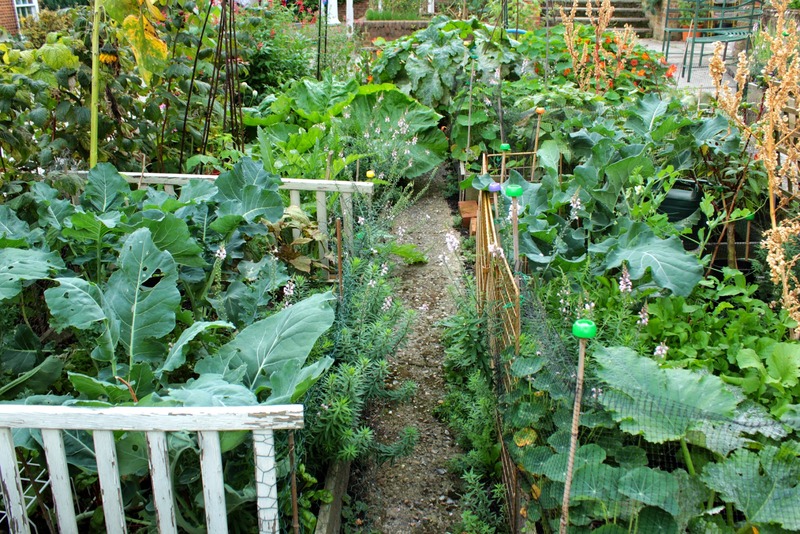 It all looks very lush and green but there's very little to eat apart from masses of herbs and a handful of fruit. 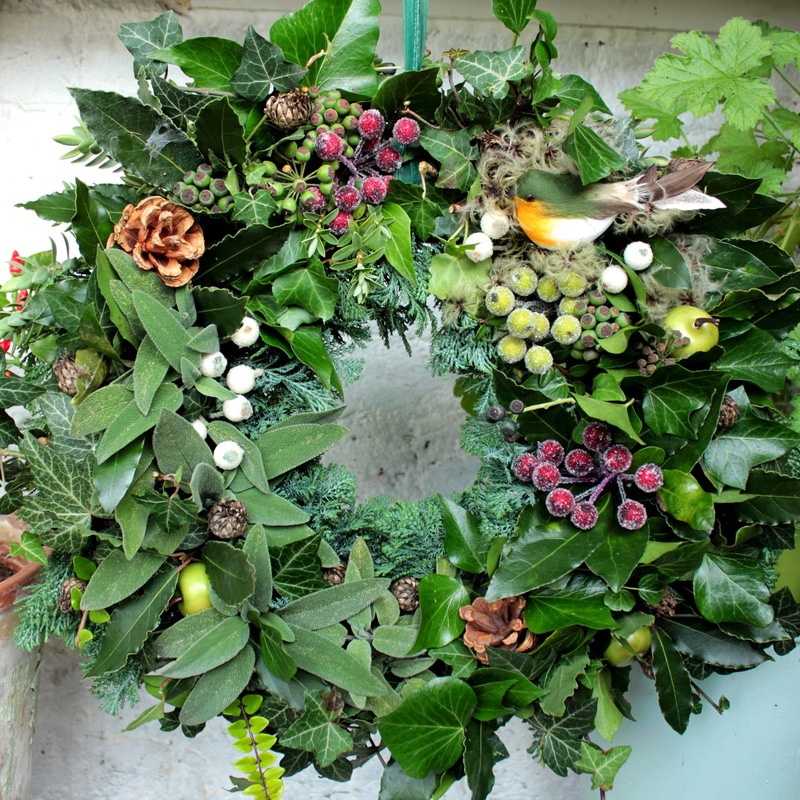 The greenery is supplied by giant rhubarb and courgette leaves, nasturtiums and herbs. I've taken off all the lower leaves of the tomato plants so that the fruit can ripen. My mistake was to grow them grouped together in the asparagus bed. I'd read that toms and asparagus are ideal companion plants so thought it worth a try. In hindsight, I feel tomatoes are better grown in a row, spaced well apart where they see the sun. I'll still have a few tomatoes when they ripen but certainly haven't had plants dripping with trusses. Possibly the water thing again and I've lost a few branches to the strong winds we (also) had in August. 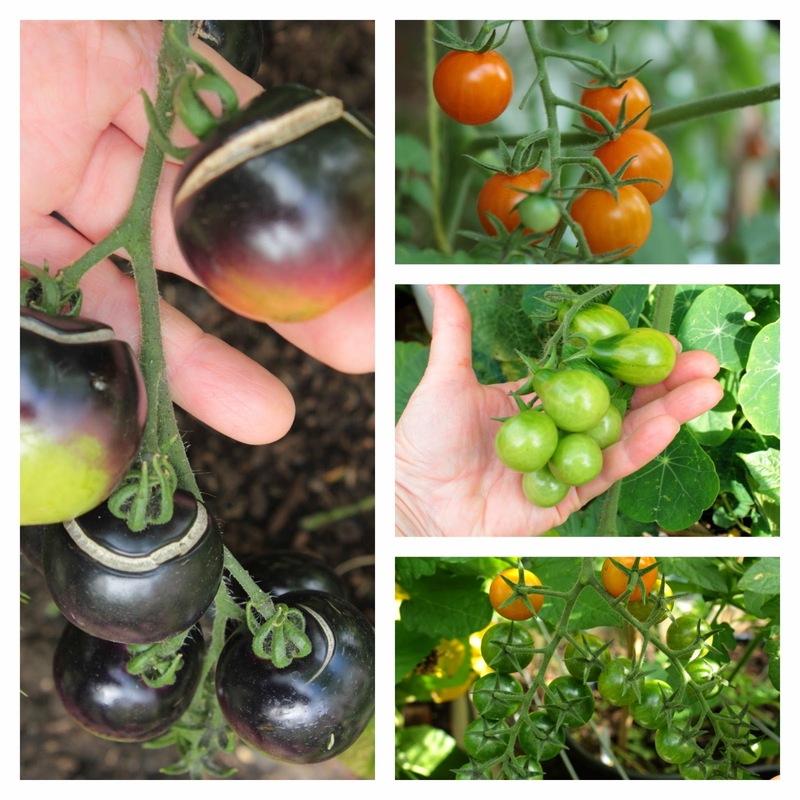 The Indigo Rose black tomato, which I know many other bloggers have been growing, seems to have very late ripening fruit; heavy rains have split quite a few and the remaining trusses are only just turning now, at the beginning of September. I'll leave these as long as possible to see what flavour develops. Let's give them a fair trial. 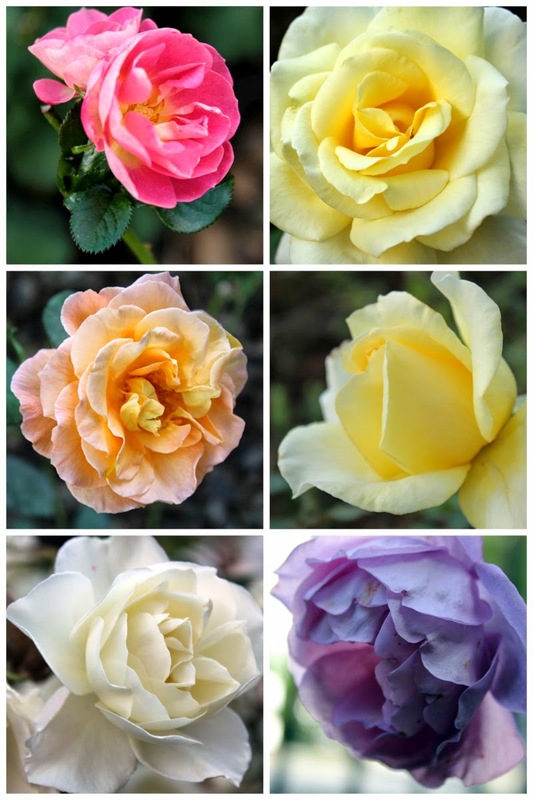 Clockwise from left: Indigo Rose, Maskotka, Yellow Pear, Sungold. The artichoke looks dead but I'm thrilled to see that there are new shoots coming up at the base. (I had been wondering whether it had suffered a premature death.) The bush beans are slowly starting to produce, a handful here and there, but nothing like the glut I was expecting - and the plants are still attracting black aphids. (I won't be sad to see the back of those come winter.) I haven't had any strawberries to speak of this year but ten raspberry canes have been producing a small bowlful about twice a week. Tall beans and cucamelons have been non-starters with the lack of water - or maybe I was tempting fate by installing an enormous 2 metre arch for them to scramble up. 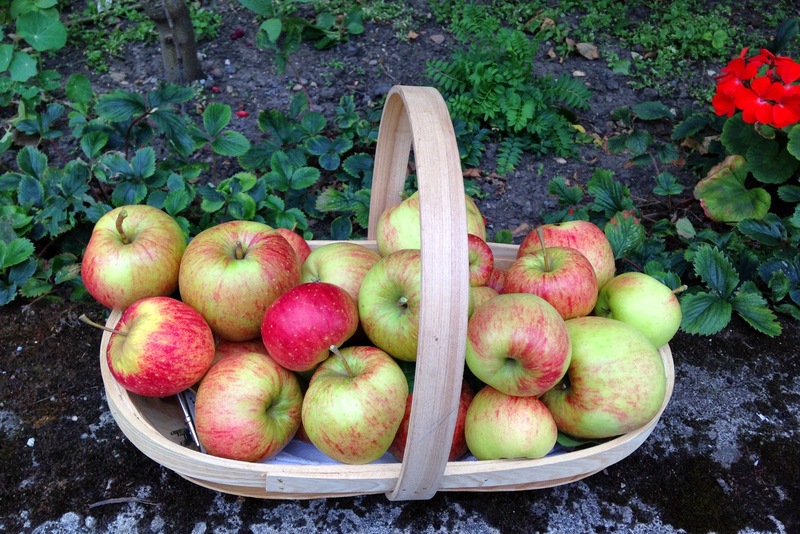 By mid-August I noticed that every time I went to the garden, I found apples with one bite taken out of them before being tossed aside. Grrrrrr. To curb my frustration and thwart the miscreants, I decided to pick all the remaining fruit. The taste was okay (another 3 to 4 weeks would have been preferable) and at least I have a few for purée, crumbles and chutney. They'll go nicely with my green tomatoes and courgette. Plants of Romanesco cauliflower, broccoli and okra from seeds sown back in May and potted on. I put wool slug pellets around them and cages over the top to deter pigeons. They've doubled in size in the past week. Chilli plants, still ripening but turning the most amazing colours! Be vigilant! I squished some grey aphids off the broccoli yesterday and have seen butterfly eggs on a neighbour's cabbage leaves so netting the beds is the next step. 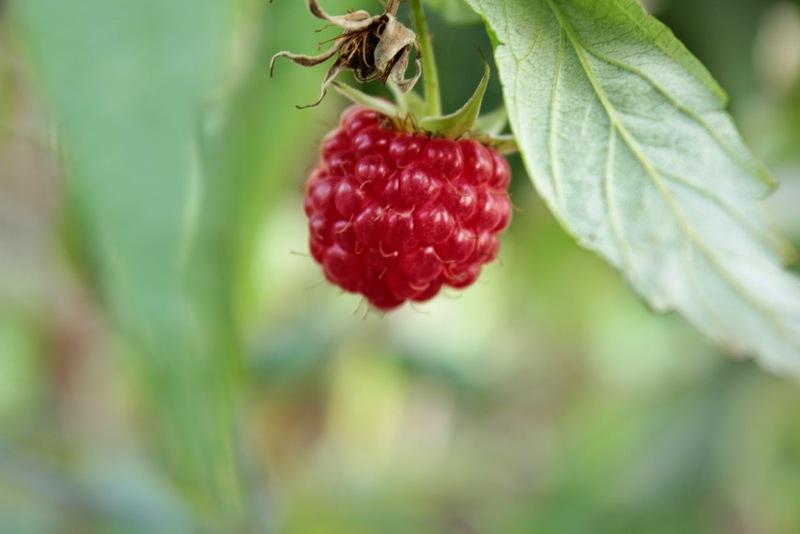 Chop back the strawberry top growth and pot up a few of the runners from Mara des Bois plants. These will replace the plants I was donated several years ago. Move plants. I planted the lovage and pineapple sage too close to each other so one will have to be moved. Make more chutney and jam. The rhubarb that I'm growing is Glaskins Perpetual. It has a reputation for having a much longer season that other varieties and is looking really healthy. I'll try taking a few more stems for the freezer and for preserves - I've found a nice sounding recipe for Rhubarb, Rose and Cardamom jam. Very exotic! Sow more spinach. I can never have enough of the stuff and the seeds sown last month are now being harvested as baby leaves. Weeding! The dry weather gave me a month off this chore, now it's back to reality. 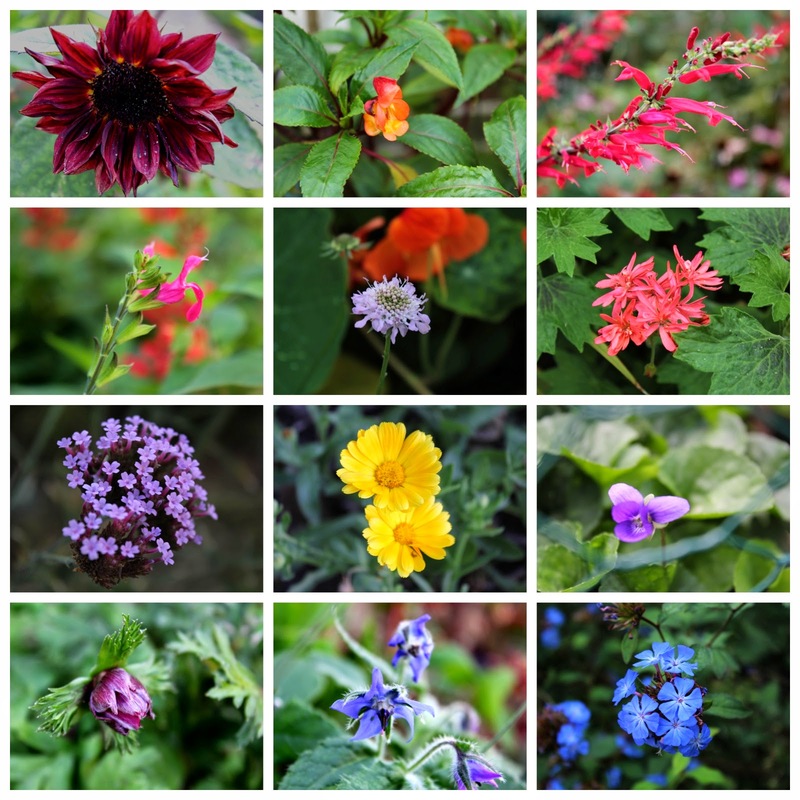 This post was destined for the monthly Garden Share Collective but I missed the link-in deadline. 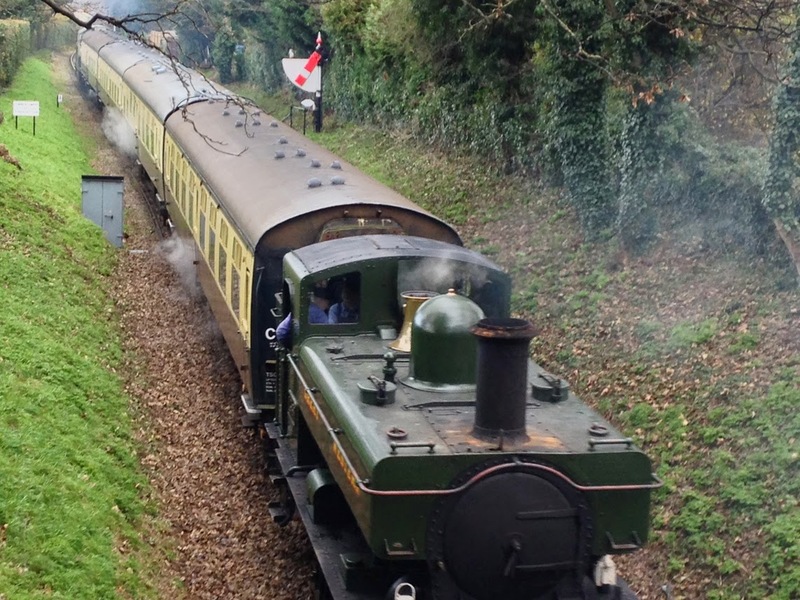 The other posts can be read here on Lizzie's Strayed from the Table blog.